Governor Jim Doyle says it&apos;s hard to imagine just how much water there is in the state right now. The Governor spent Monday afternoon touring flood damaged areas across southern Wisconsin. He says small creeks have turned into raging rivers, roads and bridges have been washed out, and hundreds of people are dealing with flooded basements and destroyed homes. 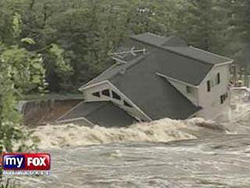 The Governor has declared a state of emergency for 30 counties, in the wake of heavy rains that fell over the weekend. Doyle says the state is making help available to those impacted by the floods. Members of the National Guard are responding to help fight rising waters and other state agencies are helping to assess the flood damage. Doyle says it will take some time before the full extent of the damage is known. His biggest concern right now is that more rain will fall. The Governor says many areas already have more water than they can handle, and the situation will only get worse if Mother Nature gives the state more rain to deal with. Despite the devastation he&apos;s witnessed, the Governor says he&apos;s impressed with how communities have come together. He says it&apos;s a tribute to the spirit of Wisconsin that so many people have come out to help with recovery efforts. Watch amazing video from My Fox Milwaukee TV.